We’ve had a look at the documents provided for application DC/14/89953 and have made a few notes. Go to the LewishamPlanning Portal and search for the application number or ‘Creekside’ (it’s the first one listed). Then click on Documents to find the ones referred to below. Email your comments to planning@lewisham.gov.uk with the application number DC/14/89953 in the subject heading, and include your name and address. Although the statutory 21 days has passed, comments will be accepted over the next month and up the time (tbc) the application goes before the Planning Committee. Compared to the monster nearby which is about to grow into an even larger carbuncle (Creekside Village East and Greenwich Creekside East) this could be viewed as a fairly benign development of a long derelict site, if it weren't for the height of the buildings and the very low percentage of affordable housing. Public access to the Creek where there was none before is welcomed, as are the ‘artist workspaces’ providing signs of life on the ground floors. Of the 143 residential units, only 18 are so-called ‘affordable’ (13%). These will be contained within a 6-storey building fronting Creekside. The heights of the buildings overall range from 6 to 16 storeys and the construction is planned to take 20 months. 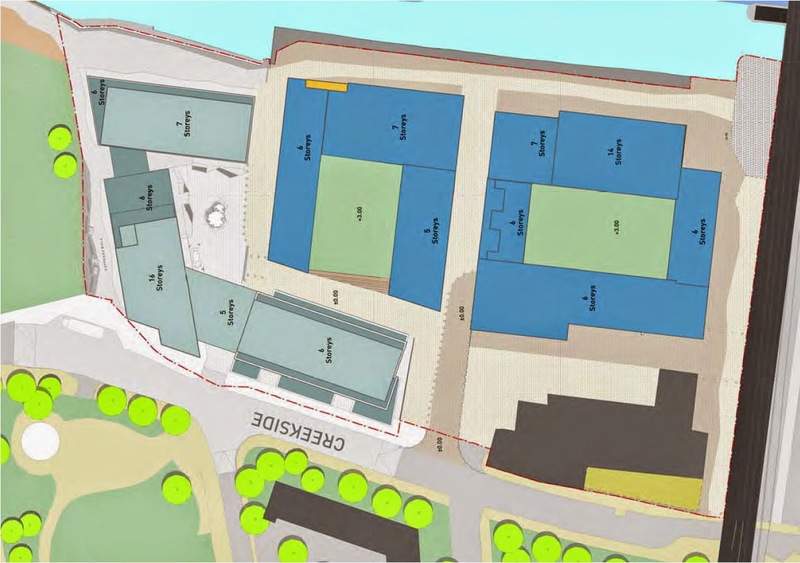 The developer, Bellway Homes, was also asked to draw up an “indicative masterplan” of the adjacent Sun Wharf site (presently occupied by Jones on lease till 2022). That site could generate a further 242 ‘homes’ to add to the 148 about to be built at Faircharm. 2.7 During the construction of the nearby Thames Tunnel, Deptford Church Street will be reduced to two-lane traffic with the existing cycle route, and potentially some bus services, diverted along Creekside. The Contractor will therefore ensure that any construction deliveries minimise impact to the operation of Creekside to ensure the free-flow of both vehicular and cycle traffic is retained at all times. 2.10 Drawing upon this experience and using the most efficient logistics available, Bellway Homes estimate that the development of Kent Wharf is likely to generate up to approximately 20 construction delivery vehicles per day during peak phases of the construction process. 2.15 Bellway Homes will investigate the potential to deliver construction material via the river, subject to phasing and tidal conditions. 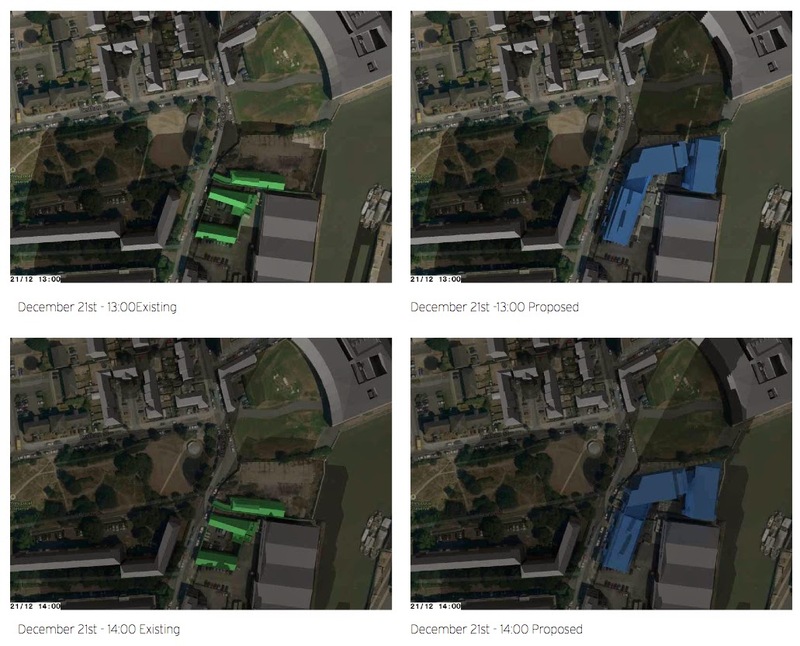 7.14 The Council are keen to investigate and promote the potential of Deptford Creek to be used for transporting materials as part of the construction phase. 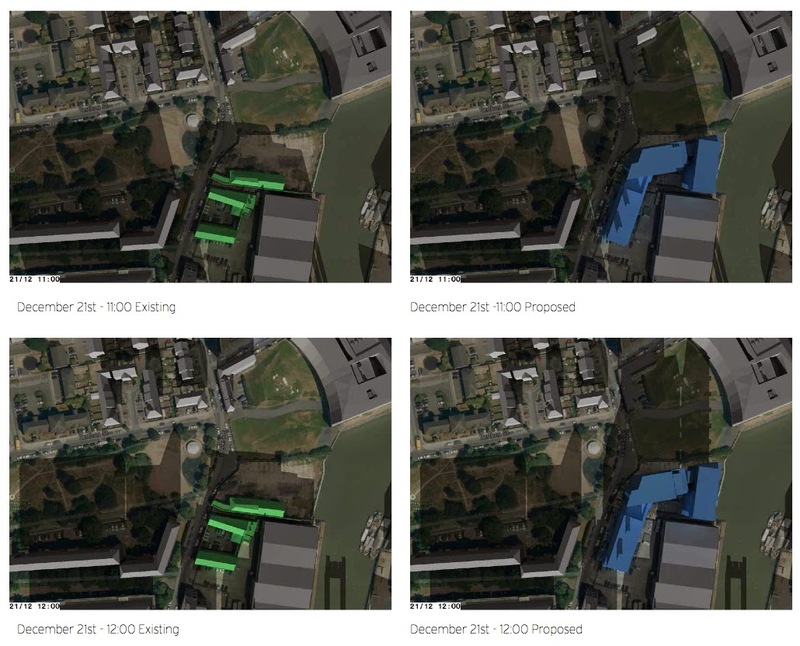 7.15 Bellway Homes have since confirmed that due to the tidal nature of the river and presence of an ecological barrier located adjacent to the river wall, it will not be possible to transport construction materials by barge. Because of the “sensitive bascule bridge on Creek Road” (2.8 Construction Logistic Plan) their lorries will be coming down Blackheath Hill and Deptford Church Street then hurtling down Creekside from the south end. Although it was a condition of the Faircharm planning application being granted that the developer conduct a feasibility study on using the Creek to transport materials, one can assume that the Faircharm developers, Workspace plc, have come to the same conclusion. Those dastardly tides! Then there is the usual old tosh about tall buildings serving as ‘markers’ – in this case, the Kent Wharf tower will serve to “denote the northern extent of the art quarter” on Creekside, and will create “a dialogue between the development…and St Paul’s Church” (and also give better views to its luxury home residents). Positioning and height of Blocks D and E (5 and 6 storeys) on Creekside “have been determined by consideration of Finch House, the existing residential block…a five storey linear block which, with its substantial pitched roof, is equivalent to six storeys.” These blocks have apparently been particularly “assessed in terms of daylight/sunlight and over-shadowing…” (p.38 Design & Access Statement). See later in this post for more on the Sunlight/Daylight Report. The breakdown of provision can be found in the Application Form. Private housing: 41x1-bed, 66x2-bed, 18x3-bed. ‘Intermediate’ housing (not ‘Social Housing’ then! ): 4x1-bed, 13x2-bed, and only one 3-bed flat. (This compares to 18 private 3-bed flats). So, less wealthy families raising two children beyond primary school age (when they might require separate bedrooms, especially if they are different genders) are not encouraged in this development. Only 3 parking spaces are available for "affordable accessible" units (disabled occupants in the ‘intermediary’/’social housing’ units). If these are not taken up, they can be offered for purchase by other residents. There is no other parking provision. Like Faircharm, this is a ‘car-less development’ (or whatever the buzz word is). So where they gonna park? Well, they can park on the street, can’t they! The Transport Assessment has a whole section on Parking. It estimates a demand for 0.481 spaces per dwelling, making it 69 vehicles requiring parking at night and on weekends (or rather 66 because there are 3 provided onsite). The ‘commercial’ spaces (artists) may generate a further 29 vehicles. There is also a 20% rise in car-use in Lewisham to take into account. The consultants conducted a local survey on available restriction-free on-street parking during a couple of days in June 2014, covering a 200m and 400m radius. They concluded there was enough space to accommodate drivers from Kent Wharf, Faircharm and the potential new 2020s development at Sun Wharf. The figures in the Appendix are difficult to decipher, but it would appear they didn’t include Crossfields in their on-street parking survey. This is where many of the local workers and visitors park – so no wonder the survey found plenty of space elsewhere! 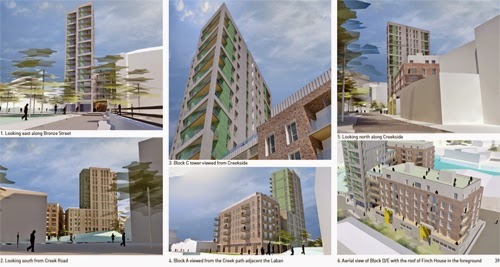 But all that is completely irrelevant, since Lewisham wants to introduce a CPZ on Creekside and other streets nearby and for the developer to contribute money to the implementation of such a proposal. And a condition of a CPZ will be that Kent Wharf residents and ‘commerical’ renters will be totally exempt from applying for a parking permit. “Should the CPZ come forward,” says the Transport Assessment, “clearly parking impact would be nil…” Of course, they could always park on Crossfields – unless the residents finally drop their resistance to Residents Permits. It goes without saying that public transport links to Kent Wharf are fantastic. But if one extrapolates the new population from the number of bedrooms (and treat a 1-bed flat as potentially sleeping x2, and so on with the larger flats), there could be up to 500 people moving in. That could make quite an impact on local routes – and it’s not looking good for South Eastern train users right now or in two years’ time (see 853’s latest post). Never mind, they’ll all be cycling! 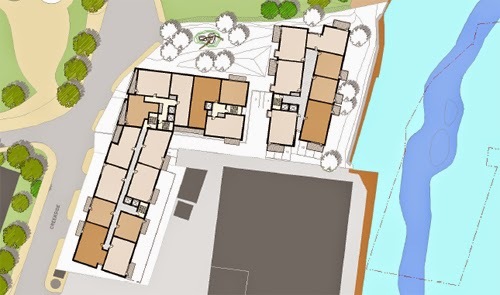 Or at least half of them – the secure cycle storage provided at the site (a single space for 1- and 2-bed dwellings and two for 3-bed flats) is fairly generous. There’s no provision for the ‘artists’ though – apparently they will want to bring their cycles into their studios, (cos that’s what artists do). The only other comment we have to make right now on Transport is the rather bizarre statistics on road accidents that have been compiled by TfL (p.105 of the Transport Assessment) in the 60 months leading up to April 2014. We can find no mention of the fatal death of TJ who was knocked off his bicycle by a hit-and-run driver on Deptford Church St at a legitimate crossing in March 2012. The omission renders these statistics a tad unreliable. • It ensures the ground floor spaces – unsuitable for residential use because of the risk of flooding – will be occupied and in use from the outset. Yeah, right, even though your buildings are going to completely loom over Laban in the same way as Creekside Village, they'll be nicer. So when Jones’s lease is up in 2022, the development of Sun Wharf will commence. At Lewisham’s request, outline plans have already been drawn up and are presented with this application. These will not be decided upon with this application, but, being that much closer, they will perhaps be more shocking to Crossfields residents than what is proposed at Creekside Village East. Considering Bellway Homes describes Crossfields Estate as “a strong element of the area's physical character as well as the heart of the area's existing residential community" (p.11 Design & Access Statement), we wonder why it is necessary to propose yet another tower at Sun Wharf – only 14 storeys here, but oh, how easy it is to justify adding another 4 floors! Apparently, the windows affected in Finch House are just five on the ground floor, four on the first and two on the second – and residents here are deemed lucky to have faced a single storey industrial unit for the past 40 or more years and enjoyed “unusually high levels of existing sky visibility”. Yep, you Finch Housers have been spoilt! Luckily, Farrer House won’t be affected at all. But in the summer months when lots of people use the Laban’s outdoor ‘amenity space’, the renderings show there will only be a small shadow cast for a couple of hours in the early afternoon, with “the vast majority of the space receiving full sunlight during the course of the day”. In Winter, however, it looks pretty grim. 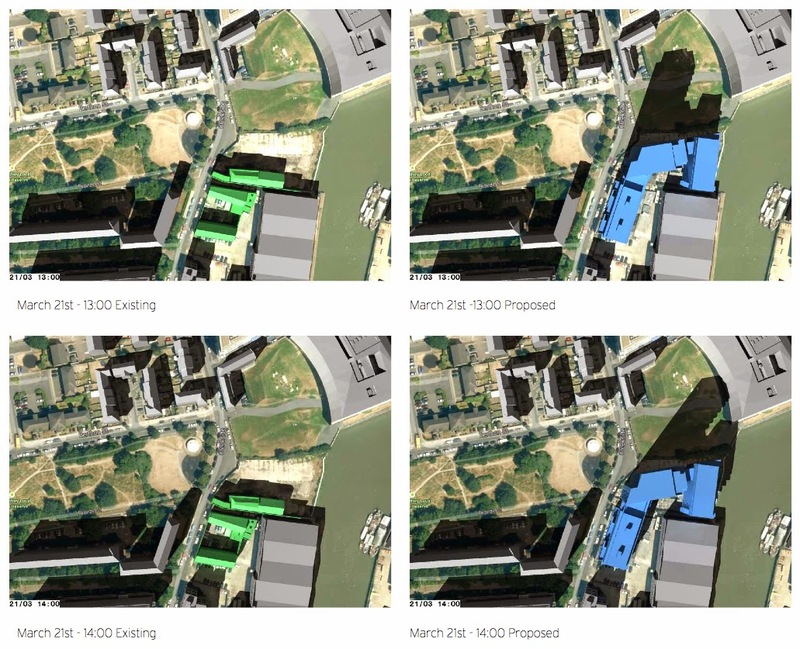 But, “our assessment shows shadows cast by the proposal but this is wholly in keeping with the existing context of shadows cast by lower properties such as Finch House. In mid-winter such shading extents are inevitable but are unlikely to significantly affect the use of any neighbouring amenity areas.” The students will be happy to walk to morning and lunchtime classes in the dark, since they won’t be doing any sun bathing, and anyway, the Sue Godfrey Nature Park is in shadow, so why not Laban as well? Appendix 8 has 11 letters and emails highly critical of the proposals shown in the second exhibition. These start on p41 and only two of these does not criticise the tower or general heights. Far from there being only 1 adverse comment on the height of the buildings, there are in fact 9. More comments, therefore, than on any other ‘issue’! 16 storeys now, of course, as if 12 wasn’t enough. But that’s OK, because after all, “the argument for height in this location is sound”. 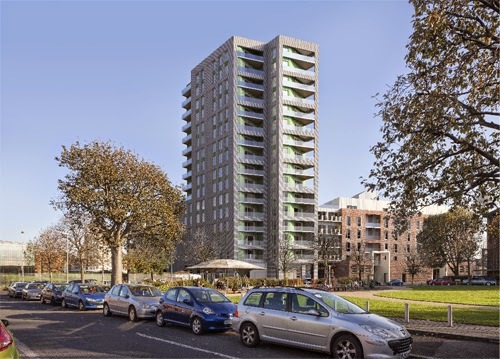 Update 24 Jan: The Deptford Dame has just posted about this development. Importantly, she reminds objectors to copy their comments to their local councillors and the strategic planning committee. I've also lodged an objection to this - the height of the building was my main issue, too! The Creek can be used for barge traffic, no barge operators have been asked to look at this. I have spoken to one operator this evening and been told it can be achieved.